Teachers, librarians and administrators are turning to online classes to support their professional development. 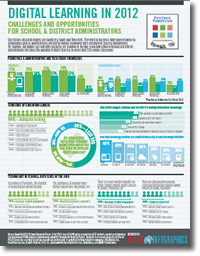 More than half of the teachers and principals (52 percent) said they have taken an online class for training purposes and almost two-thirds of district level administrators (65 percent) as well. This represents a significant shift in the past five years especially for teachers; in 2007 only 21 percent of teachers had taken an online PD course at that time. Much like their students, educators are going online to meet their professional development needs- 40% of teachers, and 50% of Principals use online professional learning communities. Educators increasingly recognize the value of incorporating digital content into their schools and classrooms, with 74% of administrators reporting that digital content increases student engagement and 50% reporting that it helps to personalize instruction. 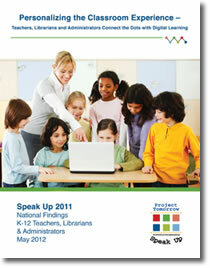 To download a copy of the first report on Student and Parent data please click here.